You’ve been at this marriage thing for a while now. You’re well aware of your spouse’s morning breath, nervous habits, and ratty sleepwear. The oh-so-cute quirks that made your partner unique are now stomping on your last nerve. You examine your in-laws with fresh eyes, wondering is that us in thirty years?! Phones, kids, and Netflix get way more attention than your relationship. While your love and commitment are real, you’re just not in the mood for Valentine’s Day this year. Look high and low for qualities to compliment in your spouse. Validate a strong work ethic. Point out a fun-loving side that’s great with kids. Name the capable skills and creative talents you admire. Notice a new haircut or attractive outfit. Tell your friends (within earshot) why you’ve got it good. Take every opportunity to build up and validate your loved one’s worth as a person. You might both feel taken for granted in the mundane work of keeping things going. Appreciate the ways your spouse helps out—filling the gas tank, mowing the grass, cooking and cleaning, getting the kids to bed, dealing with bills and paperwork—that make your day easier. Express thanks for how your partner cares for the important people in your lives. If you share about your tough day, also share thanks for a listening ear. And, praise God daily in prayer for your life together. Invite gratitude into your marriage and watch it grow. Whether on Valentine’s Day or any day, it doesn’t take a grand gesture to show love. If you pour yourself a cup of coffee, pour a second for your spouse. Offer a blanket on a cold night. Slip an encouraging note in tomorrow’s lunch sack. Make the bed. Unplug and give undivided attention to your conversation. Get off the couch to say hello when your partner walks in the door. Acts of thoughtfulness say I see you. I care about you. We’re in this together. Invite your partner to share time with you. Hire a sitter and recapture the fun of dating. Go for a walk. Hold hands. Text and call during the day, just because. Give a shoulder massage. Run errands together. Plan a weekend getaway. Dance in the kitchen. Kiss goodnight. The gifts of time and touch are priceless. A closer, more intimate relationship is within your reach. Move closer together a step at a time, and re-discover the person you fell in love with. We pray for every blessing on your marriage as you choose to love (and like!) one another this Valentine’s Day. if any of you has a grievance against someone. Forgive as the Lord forgave you. which binds them all together in perfect unity. Check out these resources to help you connect and have fun with the one you love! 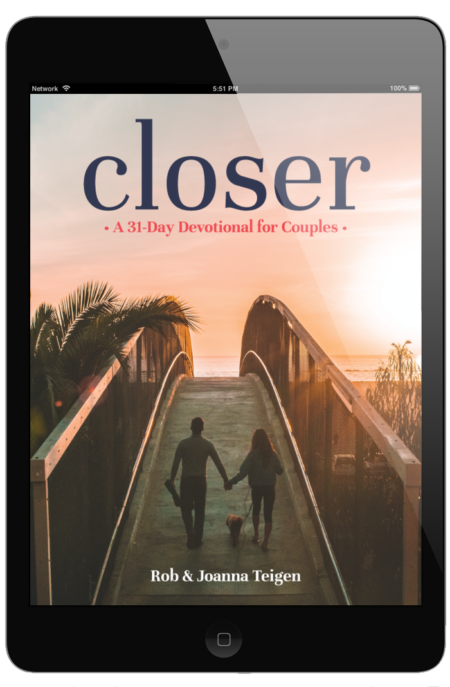 Get Closer: A 31-Day Devotional for Couples for Free!